The Story of Bhagavan Sri Sathya Sai Baba? November 23, 1926, is a red-lettered day in the history of mankind. 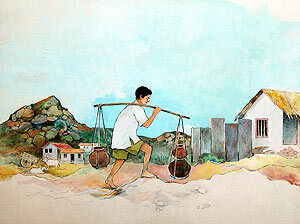 On that day was born in the (then) obscure village of Puttaparthi, a charming baby boy in the Ratnakara family. None realised then, and indeed for a long time thereafter, that Divinity had incarnated in human form as Ratnakara Venkata Satyanarayana Raju, grandson of Mr. Kondama Raju, and son of Pedda Venkama Raju and Easwaramma. The birth of ordinary mortals is the direct consequence of earlier lives. The karma or the track-record of earlier births, i.e., the nature of deeds performed, both good and bad, determine the future janmas or births. In short, human birth is a karma janma (birth that is the consequence of earlier births). However, when the Lord comes down in human form, it is a different story altogether. He incarnates as a part of His unfathomable Cosmic Drama, to play as it were, a cameo role. He decides the time and the place of His incarnation, the parents, and also how His life would unfold. Thus, the Lord's birth as a human is a part of His Divine Sport or Leela; in other words, His life is a Leela Janma. In the Sathya Sai Incarnation, the Lord chose the Ratnakara family on account of the purity, piety, and the devotion of its members. Prior to the incarnation, Pedda Venkama Raju and Easwaramma had been blessed with one son and two daughters, Seshama Raju, Venkamma, and Parvathamma, in that order. Some years passed and Mother Easwaramma longed for another son. She observed all the prescribed austerities, and soon her prayers were answered - she was to become a mother again. Even before its birth, Easwaramma knew that the child to be born would be unusual. There was a definite reason for such a belief. Sometime prior to the birth of this new boy, Lakshmamma, the mother-in-law was engaged in the worship of Lord Sathyanarayana. The Lord then appeared in her dream and blessed her, indicating that He would be born in her family. Promptly, Lakshmamma alerted Easwaramma that the latter might have strange experiences, but ought not to worry about them. Shortly thereafter, Easwaramma had precisely one such experience. 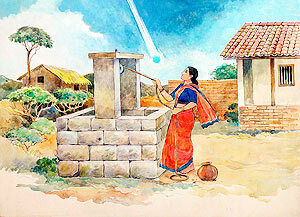 One day as she was drawing water from the well, Easwaramma was startled by the sight of a big blue ball of light. The ball came directly towards her and entered her; Easwaramma fainted and fell. The Lord had entered her womb for the mandatory stay prior to physical birth as Sathyanarayana Raju. Thus, the Lord was not begotten, but immaculately conceived, even as His Son (Jesus) had been, two thousand years ago. Sathya was born in the early hours of November 23, 1926. There were any number of unusual incidents accompanying His birth, as also in His childhood (as in the case of Lord Krishna). Though they all gave strong hints of His Divinity, few realised until much later that Sathya was the Lord Himself. But all unfailingly recognised that Sathya was most unusual, extra-ordinarily intelligent, precocious, and above all, always full of Love and compassion. In Primary School, Sathya helped His classmates in diverse ways. Though from a poor family, He did not hesitate to give away His clothes to needy classmates. More importantly, He never lost an opportunity to turn the minds of His friends towards God. Among other things, He formed a bhajan group for this purpose, which later became very popular. It was time to move on to Higher Secondary School, but such a school was available only in Bukkapatnam, several kilometers to the north of Puttaparthi. Young Sathya now had to trudge back and forth every day, no matter what the weather, the muddy path through fields, walking on bunds, and wading through water, as required. In the Bukkapatnam School too, He was a model student, ever helpful to others. 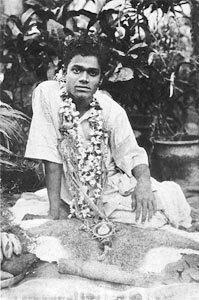 Making students God-conscious remained His prime occupation, and to hold the attention of His mates, He would often materialise prasadam (gift-articles or vibhuti), much to their amazement. Sathya was an automatic choice for the class-leader (monitor), but this brought its share of problems. 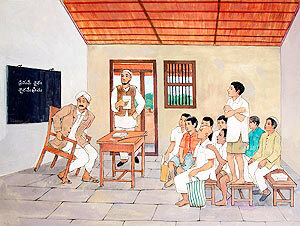 Once, His teacher asked Sathya to slap all the boys in the class for an infringement of discipline. Instead of slapping hard as he was expected to, Sathya merely patted the cheeks of the errant pupils. This greatly angered the teacher, who then directed all his wrath on the class-leader. Sathya bore the punishment in stoic silence; for Him, it was all a part of the Drama scripted by Him, and this particular scene was being enacted to impart some lessons to humanity. On another occasion, the teacher handling a particular class-hour (period) noticed that Sathya was not writing down what was being dictated, while all other students did. When questioned, Sathya replied that He was not taking down because He already knew the lesson. Interpreting this response as gross impertinence, the teacher asked Sathya to stand up on the bench, a form of punishment popular in those days. Sathya obediently did. After a while the School bell rang, signalling the end of the period in progress, and the commencement of a new period. It was time for the teacher to leave the room and make way for another one who was to handle the next period. Mr. Mahboob Khan, this other teacher, entered the classroom and to his utter surprise saw Sathya standing upon the bench. Khan loved Sathya very much, and to him it was inconceivable that Sathya would have done anything to deserve a punishment. He also noticed that the teacher who had handled the previous period was not vacating the chair. To his astonishment he then discovered that this teacher was not getting up from the chair because he was stuck or glued to it - whenever the teacher tried to get up, the chair also lifted! In a flash, Khan understood the problem. He asked Sathya to get down from the bench and the stuck teacher promptly got his release! Years later Swami disclosed that this drama was staged not to inflict humiliation on the teacher concerned but to make people conscious of His Divine powers. Humiliation is something that does not exist in Swami's dictionary. Around this time, Mr. Seshama Raju, Sathya’s older brother, went to Kamalapuram to stay with his in-laws, and also qualify there as a teacher. Kamalapuram boasted of a good school and Seshama Raju thought that this was the school where Sathya ought to study - the entire family pinned its hope on Sathya, and dreamt that one day He would go to college and eventually end up as a big officer in the Government. And so, to Kamalpuram, Sathya went. Seshma Raju's in-laws, being relatively well heeled, looked down upon Sathya since He was quite poor. As a result, He was not only ill-treated but also called upon to perform arduous house-hold duties. He had, for example, to fetch drinking water everyday from a far-off well. Such chores left scars, which remain to this day. 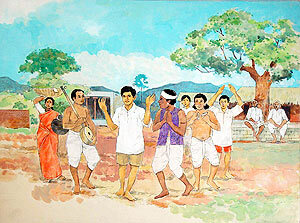 In the Kamalapuram School, Sathya was a great favourite of the Drill Master who doubled also as the Scout Master. 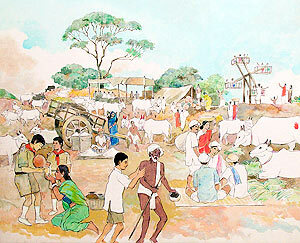 Once, there was to be a grand General Fair and Cattle Show in the neighbouring village of Pushpagiri. The Scout Master wanted his troop to go Pushpagiri and render service of the type scouts were expected to. A subscription of ten rupees was collected from each boy for meeting the various expenses connected with the trip, including the bus fare. Not having the required amount, Sathya excused Himself from joining the group but assured the Scout Master that He would somehow or the other be in Pushpagiri at the appointed time for duty. 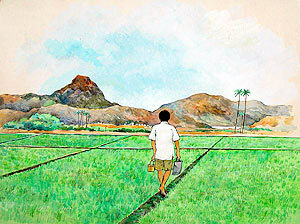 While His friends went by bus, Sathya walked the entire distance, with little to eat on the way. When He finally reached Pushpagiri, He was very tired but did not flinch from discharging His duties. Just before returning, He thoughtfully bought a few small gifts for folks back home. When He returned, what greeted Him was not appreciation for the gifts but a severe punishment because His absence had created problems with the supply of drinking water. Much later, Swami revealed that He deliberately created such painful situations for Himself in order to teach the lesson of forbearance and equanimity. Despite the harsh treatment constantly administered, Swami has never ever criticised either His older brother or His sister-in-law, maintaining always that they were but mere instruments in His Drama, with specific roles to play. His teacher's training concluded, Seshama Raju moved from Kamalapuram to Uravakonda to take appointment as a Telugu teacher in a school there. Sathya went along and joined that school. Once again He excelled in everything, and became the cynosure of all eyes. But once He was back at home, it was the same painful routine; no let-up at all.